Now Available in One Volume! 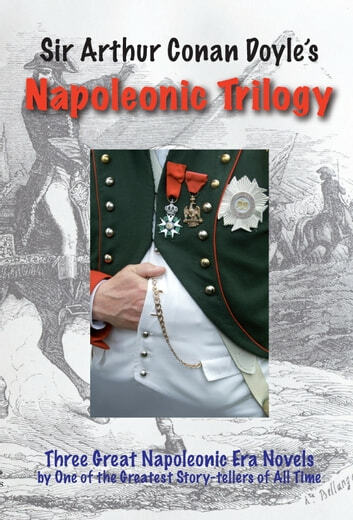 Three great Napoleonic Era Novels by one of the Greatest Story-tellers of all time. Sir Arthur Conan Doyle. Uncle Bernac: A mysterious message summons a man back to his ancestral home in France. There he finds service with Napoleon—and an uncle who is not only a vicious undercover operative, but has swindled his family out of their estates. It's difficult to take action, however, when Napoleon desperately needs his uncle's skills. The Exploits of Etienne Gerard: Move over Harry Flashman! You’ve met your match in the form of Etienne Gerard—the most outrageous Frenchman ever to don a Napoleonic uniform. The (self-described) greatest swordsman, greatest horseman, and greatest lover in the French army is turned loose in a series of improbable adventures that will have you on the edge of your seat—when you’re not falling off it with laughter. The Great Shadow: Two men fall in love with the same women, who is, in turn, swept away by a mysterious renegade Frenchman. It is an affair that can only be settled by the death of either the Frenchman or one of his English rivals. No one suspected, however, that it would require the killing fields of a place called Waterloo to resolve it.